Setting up your Dymo Label 450 Turbo Printer for Mac – How can we help? Important: Some Dymo Label Printers manufactured after April 2014 will require an update from Dymo to work with USB 3.0 ports. To learn more about this click the link here. Before printing from your Dymo, make sure you have the correct Label sizes supported with Vend. While Dymo supports a range of different label sizes we recommend 11352, 30336 or 1738541 Dymo labels. Looking for Windows PC instructions? Head over to this article here. 1. First up, Connect the printer to your computer. 2. Next, download the latest driver from Dymo's website and follow the install instructions. 3. Open "System preferences" -> Print and Scan and click on the "+" button to add the printer. 4. Add a name for your Dymo Label printer, select 'use' -> 'select..' and search for Dymo. Note: Vend does not support labels smaller than 21 mm in width or height. Jewellery labels are not currently supported in Vend. 3. On the next page put your Label size code in the 'Media Size' box. Cannot find your size here? 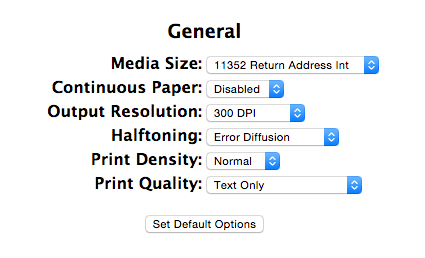 Select 'Custom Size', insert your label's paper size, choose the unit and click on the "Set Default Options". 1. Go to your Vend store and choose a product to print a barcode for. Choose your label type and click on print. 2. In the Chrome Print Preview screen, click more settings and select the 'Paper Size' dropdown. 3. Find your label size code (or nearest label size code) here and click print. Important: We strongly recommend printing out a run of 5 or more barcodes as a test to ensure that the alignment is correct.